We are in a deep freeze, and the road conditions resemble what I encountered in Novosibirsk a few years ago: mostly ice or black ice, partly covered by snow, patches of pavement. I sent my postcard in for the Almanzo 100 so I need to ride. I was successful in dressing for the weather, but not in bike prep. Head to toe I wore fleece hat, headband, sunglasses, face mask, neck gaiter, poly tee, wool long-sleeve base, wool sweater, heavy winter shell, heavy ski gloves, cycling shorts, heavy tights, poly wind pants, wool socks, winter boots. I should have worn ski bibs instead of my lightweight poly wind pants, and I need to buy a pair of mittens or equip a bike with wind protection for my fingers. Bikes were a problem. The IRO Mark V fixed gear has no brakes, so flat pedals are out. But my Adidas cycling boots are not warm enough for 0 deg F. I wanted to ride the BoSS, but I found that the brakes were frozen in place from the freezing rain and grime of our road trip home. I departed optimistically on the ExtraSpesh, after swapping pedals from the BoSS. All went well for about 5 minutes, when a 20-second hiss drained the air from my front tire. Of course, I raided the ExtraCycle's usual tool kit when we left for our road trip, so I was without tube, wrench for lug nuts, and tire levers. I briskly walked the bike home. By avoiding a stop at the coffee shop I was able to call it "some exercise," plus the boys are dying to go skate later today. [caption id="attachment_150" align="alignright" width="233" caption="Lance went & got a fixed gear just like mine!"] [/caption] I think Lance must have gotten word that Darcie is a big fan. I see that he went out & got Trek to build him a fixed gear that looks just about exactly like mine, down to the sweet mustache bars. I saw this pic in an [article](http://www.sahtel.ee/?p=635#more-635) on the Mash SF crew. Me & the BoSS went to Theo Wirth yesterday. Same old story, except * Hadn't been there since last July or August, * New platform pedals no clip/cage, and * I'm out of shape for off-road singlespeed heart rate intervals. But wow, riding that bike off-road **is so fun! ** I've been miserably jetlagged and stressed out about work for 3 days. And after the ride I felt just plain happy. The platform pedals worked out ok. I need a move for curb/log obstacles. With clipless I wheelie over then hop the rear wheel up/over by pulling up with my legs. On the platforms I was terrified of pinch-flatting the rear every time. The BoSS was "rode hard & put away wet" when I visited in Feb. The chain is damn near rusted, whole bike is dirty as hell & signs of the road salt I didn't wash off. The brake setup is almost dangerous... She'll spend time at One-On-One when I go back to London next week. Yes the rumors are true. 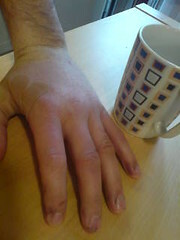 I got my hand run over by a red London bus, Thursday morning on my way from home to the office. The good news is that I'm absolutely fine except for my left hand, I didn't lose any range of motion, and the x-ray showed no broken bones. There is some risk of nerve damage or wrist problems that didn't show up yet. I see a specialist this week to check that out. Today I rode half a mile to Odd Bins for a bottle of Chardonnay and things weren't too bad. I hope to start commuting the middle of this week. I can also type reasonably, tie shoes, and drink tea already. I got a very interesting gash where the skin between my thumb and index finger popped open like a chicken breast when you pound it thin to make chicken scallopini. 5 stitches, the scar will be pretty cool. I passed the bus on his right (outside) as we were moving through an intersection in a right turn. I was trying to move around a truck to move through stalled traffic. That truck braked, I brushed its back left corner with my right arm, which knocked me off balance. I fell left, arm sprawled out, felt fine but scared in traffic, then I felt the bus tire move onto my hand... Thankfully it was entirely below the wrist, and kept moving instead of stopping on my hand. Don't know about you but I can't stand to think about it much more for tonight. Darcie is starting a pool for guessing how many different colors my franken-claw will turn, and bonus for how many fingernails I lose. I'm embarrassed that my country won't pay London's congestion traffic fees. Message to diplomats: Respect this, pay up, start riding bikes, and use the Tube.